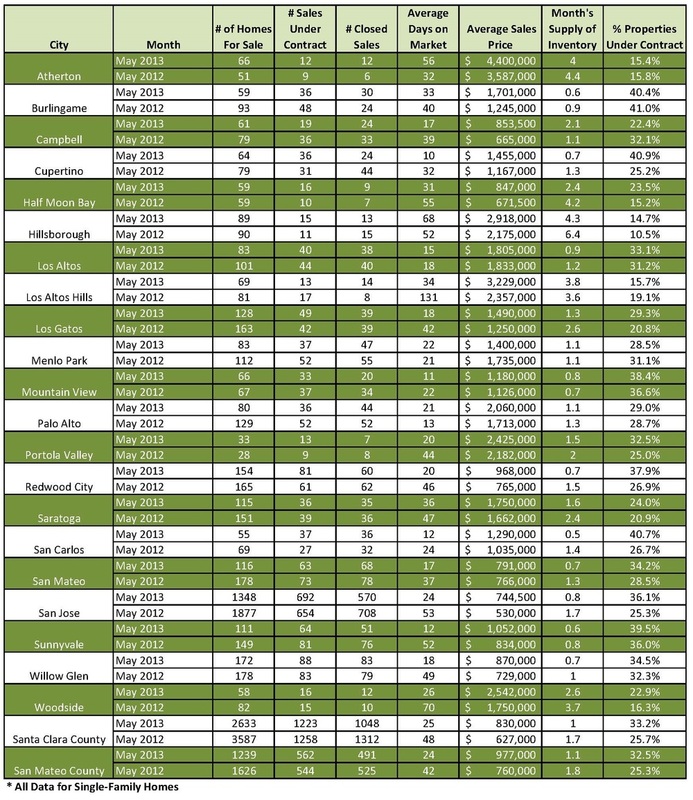 June 27, 2013 Daniel G.
Over +30% of ALL listings are currently under contract in both Santa Clara and San Mateo counties. Santa Clara County Median Home Price rose +32% over last year to $830,000. San Mateo County Median Home Price rose +29% over last year to $977,000. The number of single-family homes for sale dropped almost -30% in both Santa Clara and San Mateo Counties in May 2013 vs. last year...Inventory continues to remain extremely tight! San Jose’s Median Home Price in May made the highest gain over last year at a +40% increase to $744,500! Palo Alto remains one of the hottest markets with the average home price for a single-family home topping the $2M mark in May, and only 1.1 month's supply of inventory for sale. San Carlos and Burlingame have some of the lowest supply of homes available for sale today – only 18 days or less! Los Altos Hills’ days on market (DOM) has dropped by -74% from 131 days to 34 days. Cupertino, Mountain View, San Carlos and Sunnyvale are all experiencing average DOM of 12 days or under representing a -50% to -77% drop from last year. Silicon Valley remains one of the most competitive real estate markets in the country. Contact me to find out how I can help you buy or sell your home today!